This isn't another one of those Law of Attraction Valentine's Day articles telling you how to manifest your soulmate. …Yes, you can have a Valentine's Day filled with love and romance – even if you're single! It's easy to fill your day with love and romance, chocolate and flowers, bubble baths and romantic dances…whatever you want. You begin by thinking of yourself as a love magnet. Imagine that you are drawing love to you from everywhere. You are drawing love to you from everywhere. You are a shiny, glowing beacon for love. The more you feel the love, the more love comes to you. Your love knows no limits. The best part is – the more love you send out, the more love comes back to you. As the love comes to you, you know that you can make your dreams come true. The more you love them, the faster they come true. Now with great feelings of love, write out how you would like your Valentine's Day to be. Write it in present form. I have a wonderful Valentine's Day filled with love and hugs. Everywhere I go, people have a smile on their face. I hear kind words from everyone and it feels fantastic! I feel the love all around me, and truly enjoy thinking loving thoughts about everyone and everything. It's so easy! I am so in love and feel loved beyond my wildest dreams! I have the most amazing dinner, filled with laughter and smiles. The waiter compliments us on how in love we look and how we inspire everyone who sees us. I have so much joy in my heart! I send love to everyone in the world. I see them all having a wonderful Valentine's Day. I am so incredibly lucky and blessed. I see myself eating the most delicious meal, curling up on the couch, and watching my favorite movie. I am so happy and fulfilled. I'm glad I'm taking this time to be with me. I love me! 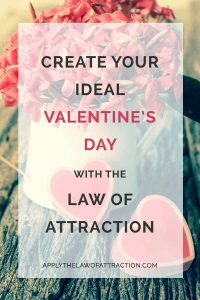 Now it's your turn to create your Valentine's Day with the Law of Attraction. What is your ideal Valentine's Day? What a wonderful way to think about Valentine’s Day! Love me! Love you! Love everyone! Thanks and here’s to everyone having a wonderful, fun filled Valentine’s Day.